The 1990s were a strange and turbulent time for comics. Companies and characters rose and fell, variant covers were the norm and we were all overwhelmed by pouches, shoulder pads and huge guns. No other publication captured the ebb and flow of this period in comics better than Wizard Magazine. The bottom line is if you read comics in the ’90s, you were pulling Wizard monthly as well. Ed Piskor (Hip-Hop Family Tree, X-Men: Grand Design) and Jim Rugg (Street Angel, The P.L.A.I.N Janes) are two current creators who remember the magazine and have still have a love for it. So much is there love that the duo produces a weekly podcast, Cartoonist Kayfabe, that heavily covers the subject (among other things). Ed and Jim were awesome enough to take time from their busy schedule to talk to us at Monkeys Fighting Robots about Cartoonist Kayfabe; what drives them to do it, why they think it matters and what we can expect in the future. We also get into some good old ’90s comics discussion. Give it a read and then comment below on your favorite issue of Wizard or your favorite ’90s comic property. MFR: First off for those who haven’t checked out Cartoonist Kayfabe yet, give us a rundown. 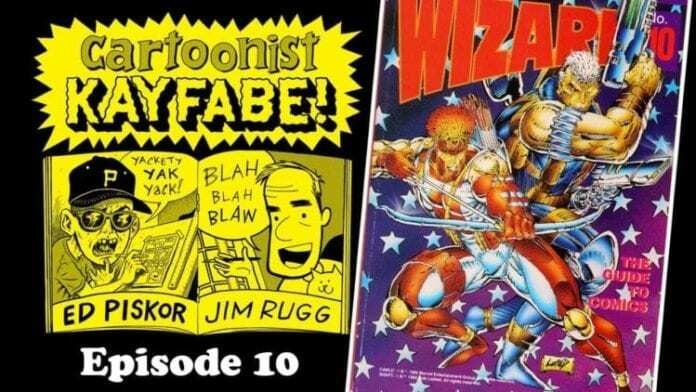 JIM RUGG: Cartoonist Kayfabe is a YouTube channel that Ed Piskor and Jim Rugg created about comics – past, present, and future. Our longest running show is a week-by-week review of Wizard magazine starting with issue #1. We use Wizard as a timekeeper to go through ’90s comics history – one of the most incredible decades in comics history. Record sales, Image Comics, the internet, death of Superman, Marvel bankruptcy, distributor armageddon…it’s a wild time period. It’s also when we were readers and before we started making comics professionally. So it’s a chance to talk history and nostalgia with a fellow creator and self-taught cartoonist. Wizard was a gateway and peek behind the curtain. And we mix it up. We’ve done a big [two]-parter on an issue of The Comics Journal from 1992 that looks at the mainstream comics industry from a different perspective than Wizard. So part history, part comics, lots of fun. Livestreams of the recording are weekly too. These are raw and feature us, rather than the magazine camera. It’s the raw material that we then edit. So we stream that and people watch and comment and often answer our questions when something comes up like who drew something or when was something released. We also do interviews (more of those coming soon) and reviews/spotlight different comics and comics-related items. Right now we’re in the middle of a big series about Katsuhiro Otomo’s Akira. It’s called Making a Masterpiece. We’re going through the history behind that seminal work. Tom Scioli (IDW’s Go-Bots), another cartoonist, joins us on that. Besides Akira, we’re looking at some of Otomo’s earlier works like Fireball and Domu to consider how someone creates such a remarkable work. Weekly Shoot covers what we’re up to, what we’re seeing, watching, reading, thinking about. We take questions and topics from readers. Discuss what we’re doing, events and projects where people can find more of our comics and art, and whatever else is on our minds that week. MFR: How did you two guys meet? RUGG: I was trying to make comics in the early 2000s. I would meet another cartoonist, Jason Lex at a comics shop in Pittsburgh every week – Phantom of the Attic in Oakland. Then we’d grab coffee and share what we were working on. It’s a great shop, great people there, and they introduced us to Ed and Tom Scioli. And for a few years, we’d all meet up weekly. Then we started carpooling to shows and that was that. PISKOR: It all happened pretty naturally. I got my first opportunities with Harvey Pekar on American Splendor when Jim got his Slave Labor Street Angel book. It makes sense that in a town of 300,000, that the 3 or 4 people who make comics should know one another. MFR: How did you find out you had a mutual love for Wizard Magazine? RUGG: We’ve spent hundreds of hours in a car to different shows. You find out a lot about each other’s comics histories, interests, and ideas driving down the road. A lot of people our age who love comics have nostalgia for Wizard (if not outright love). Pre-internet, information was hard to find. Wizard was easy to find and had some information. So we hear from lots of cartoonists and long-time readers that have similar feelings. PISKOR: You’d be hard-pressed to find anyone in our generation of cartoonists who wasn’t affected by Wizard. MFR: When did your first get the idea of doing Cartoonist Kayfabe? RUGG: We did Baltimore Comicon in October (shout out to Marc Nathan who runs the show and inadvertently set these wheels in motion when he booked us, thanks, Marc!). Ed mentioned the idea of doing a YouTube channel where we went through Wizard magazines. I grabbed all the Wizards I could find at that show and we started recording two weeks later. PISKOR: That’s about it. I found a YouTube channel where a guy was going through Nintendo Power magazine and I figured I can put use to this box of Wizards I have over here. MFR: How long do you plan to keep on going? RUGG: We’ve talked about going through the entire 90s. But we’ll see. It depends on the response as well as the way we feel. These things are time-consuming so if we decide we have a better idea, we may change directions. We’re getting ready to record issue 16 so at least 16 issues! PISKOR: Yep, short answer, we’ll continue to do them as long as it’s fun, but the youtube channel is a long term investment and will have lots of unique programming. MFR: Is there a particular issue either of you is looking forward to the most? RUGG: Issue #31 is one of my favorites. It features Legend, Bisley, and the unexpected death of Tundra! My favorite one that we’ve reviewed so far is 10 – Rob Liefeld cover with Shaft and Cable. That issue was my first as a kid. So it was very fun to revisit it and it was a jammed packed issue loaded with good stuff to talk about. PISKOR: Issue #37 is my first Wizard and I’ve read it front to back a zillion times. After that there will be some great features for us to cover like Todd Klein lettering demonstrations, a piece on the Kubert School that’s near and dear to me, a bunch of inkers work on the same illustration and talk their process. Can’t wait to get to that stuff. MFR: Gotta bring this up…Hero Illustrated…are you guys going to touch that subject? RUGG: Yes. I think it begins in 1993. So we’ll cover it when it shows up. Not sure exactly what we’ll do with it, but we both have boxes of Heroes Illustrated so stay tuned if that’s your jam. 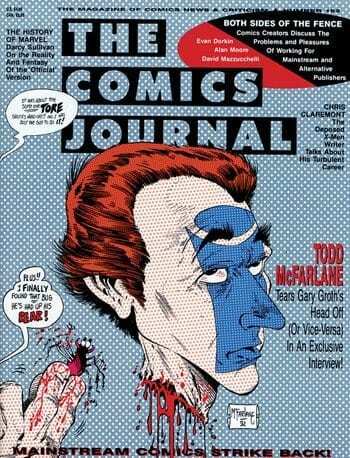 We just did a giant [two]-parter about The Comics Journal #152. It came out around Wizard #12 and focused on “mainstream” comics, i.e. Marvel, DC, Image. So it fit very well with what we’ve been doing but at the same time looks at this time period and these comics very differently. So we’re not just looking at Wizard. PISKOR: Lots of that stuff in Hero Illustrated might be redundant but we’ll probably cover them in some capacity. MFR: So, how long does it take to put an episode together? What are the logistics? RUGG: It takes me about 2 weeks. We alternate episodes. So we record each week and that takes about 6-8 hours (we record other shows, like the Weekly Shoot too). Spend the week reading Wizard, making notes, doing research, and pulling books. Then we record. If it’s my episode, I take the files home and edit them in Premiere. That involves cleaning up the footage and audio and cutting a lot of “uh’s” and tangents and retakes. While I edit, I keep notes on visuals that I want to add like comics references, video clips, graphics. I also note details I want to cut into trailers and any other excerpts like Palmer’s Picks. Then I create visual materials from the list. Add those. Render video. Cut trailer and excerpts. Upload it and write the summary and further resources notes and links. Export the audio file for the podcast feed. Upload that, schedule it, and boom! Time to do it again. It probably takes about 20 hours over 2 weeks so like 1 day a week. MFR: Why do you think it’s important to look back at this era of comics journalism? RUGG: Haha. You called Wizard journalism! Haha. I believe history is important and interesting. There’s not a lot of coverage of Wizard beyond bad jokes. So this is a show I want to see and since it did not exist, we decided to make it. Wizard, comics journalism…lmao…what Wizard provides is the timeline of ’90s comics based on marketing/promotion/ads. Comics in America have always been a commercial product so it works great for that record. It’s a very entertaining starting point for us to get into the comics and artists we loved or hated or thought about. PISKOR: Yeah, Wizard is a rag, but it gives us some groundwork for our discussions. We’re basically just talking about the era of comics that solidified our future career paths, and I think what viewers/listeners are gravitating to is the enthusiasm we share for those goofy old comics. MFR: With the rumors of Wizard’s return, do either of you feel there is still a place for it in today’s comic book industry? RUGG: I don’t keep up with the direct market like I used to so I have no idea if there’s a place for it. MFR: Have you heard from any former Wizard employees, writers, or artists? RUGG: Yes. We’ve heard from so many people, not just Wizard contributors but other pros, writers, editors, and publishers from that era. The response has surprised me. PISKOR: People really seem to dig it. MFR: Any feedback from other pros? RUGG: We get messages every week from pros that say they love watching it or listening to it while they work. Like I said, I think if you love comics, there’s something here for you. And part of the reason I think that is because of the feedback. PISKOR: Several times a week I’ll pop onto the channel and livestream my latest inking sessions. The chat room fills up with pros of many stripes who hang out and draw too. People ranging from other cartoonists to toy makers, to animators, to one guy who designs the outfits for WWF wrasslers! MFR: What other subjects are you looking to get into? Any other ideas? RUGG: I’d like to look at some wrestling comics because they are weird and the term Kayfabe is a pro-wrestling term. I love self-published and small press weird books, specifically stuff from the 80s black-and-white boom. So I want to get into that more. We have ideas for several books and topics and guests but it takes time. We’re working artists. My total work week has ballooned up to around 80 hours a week. That’s near my limit. So yes! We have a lot more ideas for things we want to cover, but it’s too early to get into more specifics because it might be a while. MFR: How easy (or hard) is it to find all these back issues of Wizard by the way? RUGG: I have the first 100 or so. It wasn’t too hard to find, but I spend time at comic book warehouses and I have several dealers that I rely on. A lot of dealers threw out their Wizards. We’ve had store owners confirm that practice. So they aren’t as easy as some back issues to find but they’re out there. When you find them, they are usually pretty cheap. I don’t think I paid more than $1 for any of mine. I also have friends with similar interests, so there was an issue or 2 in the beginning that belonged to friend of the show, Jasen Lex (his next graphic novel is out this summer from AdHouse Books, called Washington Unbound – preorder it!). PISKOR: Our show is surely making it harder to find Wizard Magazines now, haha. MFR: Each of you, what’s your favorite Wizard Magazine cover? RUGG: Issue #10. It was my first Wizard and it was drawn the wrong size and ruffled feathers for using a Marvel and Image character team up. Fun stuff! PISKOR: Probably #44 (I think), the one with the Kubert School article. Going to that institute dominated my thoughts all the way from grade school through high school and I read and reread that feature endlessly and it would get me super excited to take those steps toward becoming a professional cartoonist. 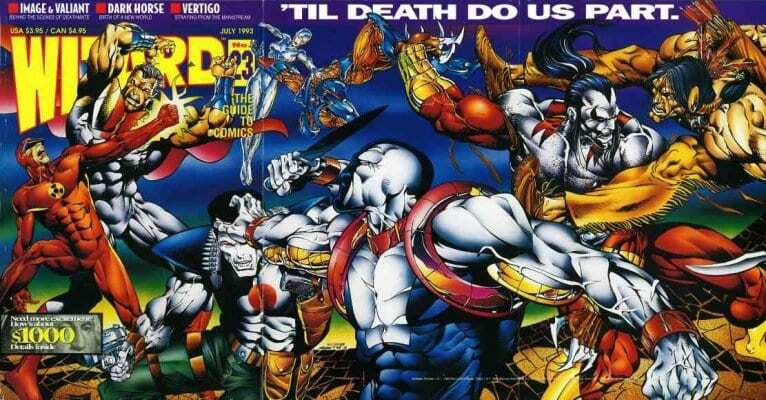 MFR: And finally, what’s your favorite ’90s comic property? Now I want to do a Lobo vs. Pitt comic! PISKOR: Everything Jim mentioned with the inclusion of Preacher, by Ennis and Dillon. You can check out Cartoonist Kayfabe here! Stuff is uploaded multiple times a week so hit it up frequently, you won’t be disappointed. Be sure to also check out Ed on his website and Jim on his!